Refugees are persecuted. They are persecuted because of their religion, their race, their nationality. They have fled for their lives. They are not simply seeking a better life economically. They are trying to stay alive. Refugees have no hope of return to the country of persecution. And refugees who are resettled to the United States have no hope of resettlement to a second country. They have nowhere to go. There are many kinds of immigrants to the United States. 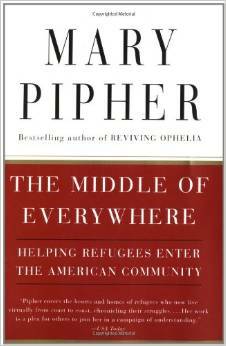 Refugees are a very tiny subset of that large, diverse group. Of the one million people who are granted green cards each year, about 6% are refugees. Of the 75 million travelers to the US each year, refugees are by far the most vetted of all travelers. They undergo multiple background checks and are intensively interviewed multiple times by roving bands of specially trained US immigration officers. No traveler to the US goes through the same kind of scrutiny as refugees do. Often this screen process can take up to two years. For refugees to be resettled to the US, the US government must be involved. Immigration is a federal matter. Refugees are expected to be full participants in their own betterment. Very little is handed to them when they arrive. Refugees are loaned the money for their plane tickets to the US and must begin paying back the loan once they get their first job. Refugees must take the first job they are offered by their resettlement agency or risk losing the limited financial assistance they receive. Most financial benefits end six months after arrival. Refugees have to begin working very quickly once they arrive in the US. Refugees are legal immigrants, must apply for green cards one year after arrival, and can become US citizens after being in the US five years. It is a time of fear in America. But fear is not an American value. To our great regret now, we turned away Jews who sought safety in America during World War II. Many hundreds died in concentration camps because we closed our borders. We interned over 100,000 Americans of Japanese descent following Pearl Harbor. All because of fear. Let us stand on the side of principle and our values rather than the illusion of a safety no government can ever truly guarantee. The MS St. Louis was turned away by the US government in 1939. Many Jews on this boat later died in the Holocaust. While the situations are not perfectly analogous, there are many similarities. The nations was gripped in fear of infiltration by those wanting to cause harm. Outsiders were vilified as a threat. Those fleeing persecution were seen as a source of possible harm. People were persecuted because of their ethnicity and religion.